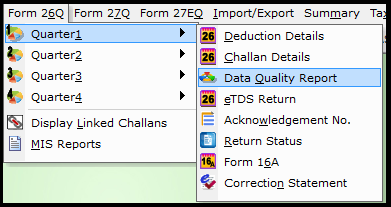 This is a unique feature given in Saral TDS which helps you verify the accuracy of the TDS return before submitting. The report takes all the details entered in the software and verifies it and shows error if any so that it can be changed before filing the quarterly return. This option is available in all the forms in all the Quarters (24Q, 26Q, 27Q and 27EQ). We will see how to generate and read the data quality report in Saral TDS. To generate this report, go to Form 26Q -> Quarter1->Data Quality Report, as shown below. The below window will appear. Click on the Generate button and an Excel sheet is opened with the summarized Details. Transporter based Deductions – Form 26Q only. “Data Total” provides accurate data vs total data i.e., if it is 10/11, then 10 data records are accurate out of total 11 records. The percentage of data shows the accuracy of data entered. 100% ensures that the data entered is fully accurate. The details of the accuracy of data can be viewed in the subsequent sheet of DQR. Any Short deduction occurs when the TDS deducted is lesser than the actual TDS to be deducted. Data will be verified against the actual required and error will be displayed in the form of Shortfall Amount. In the below image, we can see there is a shortfall amount of Rs. 20 is highlighted. The actual TDS to be made is 1800 but we have deducted 1780. Interest will be calculated and displayed for such short deductions. If the deduction made is less due to certain certificates, a remark under deduction as LOWER DEDUCTION/NO DEDUCTION U/S 197 will be shown along with a valid certificate number. Then, the data record will not be considered for Short Deduction case. If no deduction is made due to transporter payment of valid PAN, a remark under deduction TRANSPORTER WITH VALID PAN (0%) must be specified. In such cases, the shortfall amount will not be calculated. If TDS is deducted but is not paid in due time, then it will count for error in this sheet. In the sheet, we can see the number of months delayed from the due date and the interest for such delay. If the interest is paid, then the paid amount can also be seen. Note: Delay of months is from the month of deduction to the month of actual payment. The total TDS deducted and the total tax paid has to be the same. If it is not, the record will be counted for short payment. This can also be in case if the record is under short deductions, as shown below. If PAN is not available or invalid, we need deduct TDS at 20%. Such record needs to specify remarks as PAN Not Available – Higher Rate (20%). If the remark is not specified, the record will be considered as inaccurate. If any record has transport based payments, then it will be listed in this sheet. Such record has to be specified with relevant remarks of Transport with Valid Pan (0%). Note: This is applicable only if the transporter has less than 10 vehicles in the relevant FY. If the code is wrongly mentioned then the data will be shown as inaccurate in this sheet. If the 4th character of deductee PAN is C, then it has to be marked as Companies, else it will be Other than Companies. 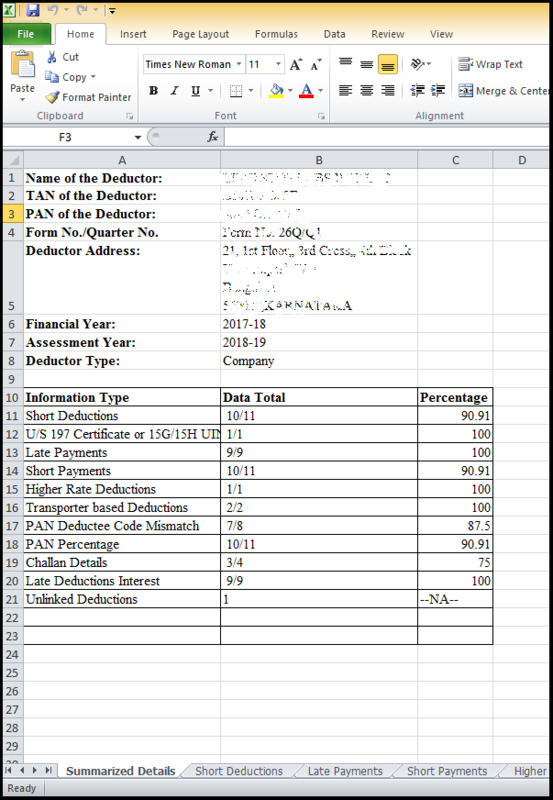 This sheet shows the records based on Valid or invalid PAN of the Deductee. The validation details will be shown at 2 levels. Structural Validation – If the entry is as per the PAN Structure – 5 Character, 4 Number, 1 Character. Online Verification – If the entry has passed the online verification, through ITD/TRACES Database. If PAN is found invalid at any stage or if the entry is not provided (given as PAN NOT AVAILABLE, PAN APPLIED etc.) then it will be shown as invalid. If the Challan entered is verified, the status of verification will be displayed in this sheet. CIN is verified either through NSDL or TRACES and the status can be seen (Valid or Invalid or not verified) in respective columns. Also displayed are the deduction amount linked to the particular Challan and if any excess/short amount available in the particular Challan. Any record where the TDS deduction date is after the Payment data, a Late Deduction interest @ 1% per month will be calculated. These records will be shown in this sheet. An example is shown below. If any of the deduction is not linked to any Challan, such records will be listed in this sheet. This sheet will be available only if the report is taken for Form 24Q. Based on the entries made (salary, Investment details, and other income) in the 4th Quarter, the records will be listed. We can verify the details before filing the return to avoid and salary details mismatch. In this sheet, the employees whose 4th Quarter salary details are not entered will be listed. We have to ensure that before 4th Quarter Form 24Q filing all the employees’ salary details who come under Taxable range have to be provided. If an employee has provided rent details of more than Rs. 1 Lakh per annum, then it is mandated to provide their landlord PAN details. If such details are not entered then such employee information will be listed in this sheet. This completes our tutorial on how to read and understand data quality report in Saral TDS. If you have any questions, ask them in the comment section below.